Free Shipping. Versatile Coverage for Top, Side or Bottom of Foot/Ankle. Help Treat Sesamoiditis, Plantar Plate Tears, Morton's Neuroma, and Various Other Soft Tissue Ailments Affecting the Feet, Safely, Naturally and Effectively! Great to use to help treat active conditions, post-operative and post-injury issues to accelerate rebuilding of injured tissues. What makes the Sesamoid T Shellz Wrap unique is the fact you can re-position the wrap over multiple areas of the foot for very specific coverage of soft tissue ailments. Allows coverage over the toes, ball of the foot, top or bottom of the foot, along with the sides of the ankle. Simply position the energy pad over the part of the foot or ankle you want to target; then simply secure the velcro straps accordingly. The Sesamoid T Shellz fits a circumference of up to 19 inches and is completely adjustable with the velcro straps. Biomechanics play a major role in foot conditions, and have a device like the Sesamoid T Shellz Wrap allows you to address these overcompensation issues. Pain in one area of the foot causes you to shift weight from that specific spot. As a result, other areas of the foot will bear more stress and will begin to experience discomfort, requiring these new areas to be treated as well. With the Sesamoid T Shellz Wrap, you now the ability to address all these factors. One basic premise of healing muscle or soft tissue injuries is to focus on enhancing blood flow to those damaged tissues. It is through the blood the body transports antibodies, nutrients, and oxygen. Nourishing your injured tissues with these healing properties should enhance the capacity of the body to help in healing of them. An effective way to stimulate blood flow to the tissues deeper within the body is through the use of an energy based on an Electromagnetic principal. Of importance, Electromagnetic Energy waves are not conductive heat waves (like a traditional heating pad is) - they operate on a different wavelength and hence, can penetrate deeper into the body. When these energy waves are emitted, they penetrate through your skin and fatty tissues until they reach your ligaments, muscles, cartilage, and tendons. Once they reach the targeted areas, they are absorbed and quickly converted into thermal energy...right at the location of the injury. This results in relaxation of the vessel walls within the targeted and surrounding tissues. The vessels gently expand when warmed, allowing for more nutrient rich blood flow along with extra oxygen and antibodies to reach the damaged tissue. 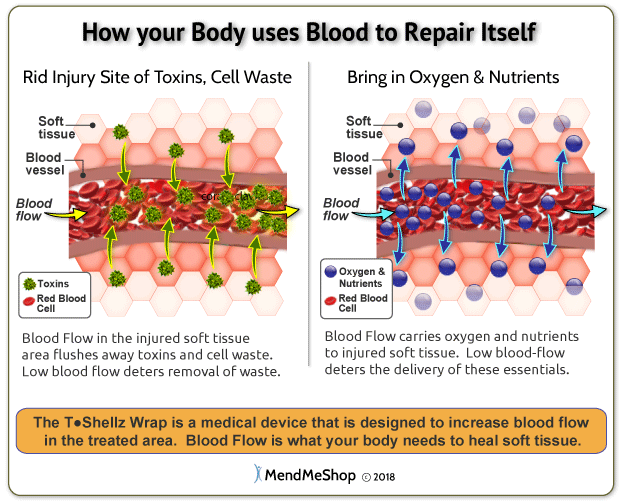 Plus, the enhanced blood flow helps in flushing cell waste and fluid build-up from the injury site - further enhancing the ability of the body to begin to heal. In comparison to a traditional heating pad (which most people are familiar with), those devices provide more of a surface heat. The heat that a standard heating pad and heated pack provides has to be forced through multiple layers of skin and fatty tissues (known as conduction). With each layer of skin the heat passes through, there will a corresponding energy loss because that heat is absorbing into each layer of skin or fat it passes through. By the time the heat reaches the targeted area deeper in the body, there is less energy remaining and hence, a lessened ability to stimulate blood flow to the injured tissues you are attempting to heal. 1. Well to begin, the T-Shellz wrap uses a very soft neoprene that feels very comforting on the body. It hugs the body in a very serene way. You will love how it feels! 2. 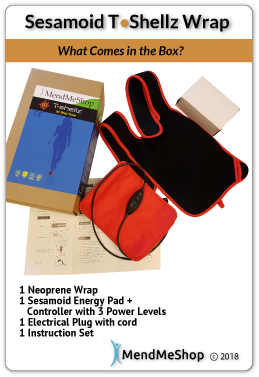 The energy pad produces a consistent and very soothing electromagnetic energy that penetrates effectively to targeted muscle, tendons, ligaments, cartilage, and more. The T-Shellz Wrap produces a beneficial energy that can target deep within your body. Receive an almost instant feeling of comfort and warmth while your injured tissues suddenly feel more relaxed and limber. The energy transfer will greatly increase the amount of blood flow reaching your injured tissues - which should result in a better capacity for rebuilding those tissues. 3. The T-Shellz has an intensity controller that is already secured to the energy pad. 4. T-Shellz Wraps are tested during the production process to ensure you receive a product that functions well and will last a long time. You will be greatly impressed with the new T-Shellz Wrap - we guarantee it with a 60 day money back guarantee. Before exercise or workouts to warm up your Achilles to prevent injury. You will also want to consider using the T-Shellz before situations where you will be walking for periods of time (grocery shopping as an example) or just doing general household activities that require a lot of standing and moving around. Before and after surgery during rehabilitation to enhance the extensibility of the tissues before physical therapy, exercising or stretching. Any time the ball of the foot or top of the foot feels tight, reducing your mobility and causing pain (especially in the morning or after sitting for extended periods of time - at home, work, commuting, etc). And any other situation where you need to increase blood flow to your foot to relax your soft tissue, relieve pain, prevent re-injury and enhance the flexibility of the targeted area! 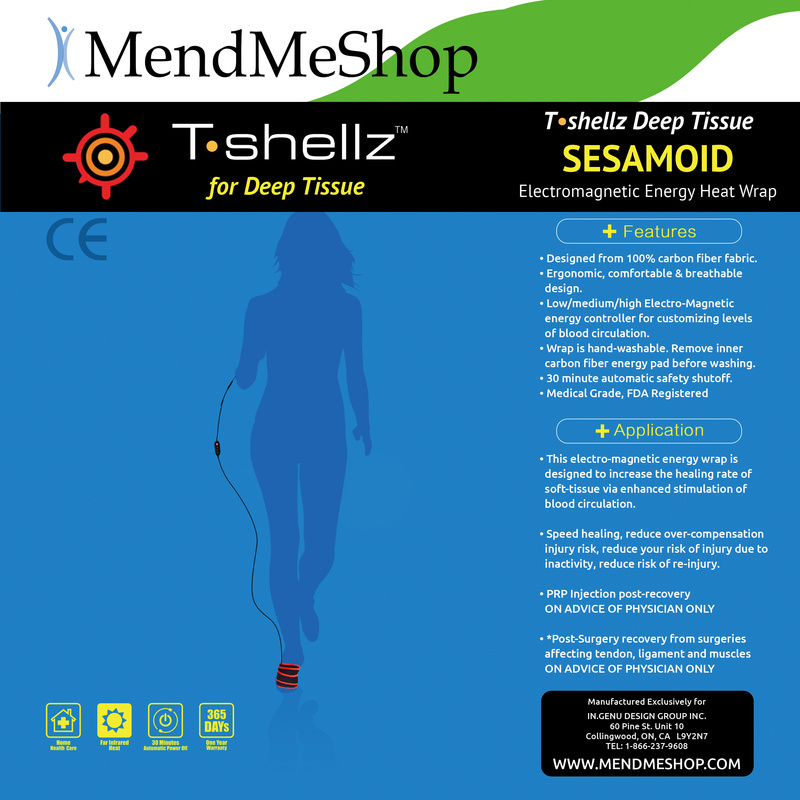 As a general rule, people will use the Sesamoid T-Shellz Wrap approximately 3 times a day - before bed, upon awakening, and one other time corresponding with one of the situations mentioned above (perhaps an hour or so after work, before exercise, etc). You are always welcome to contact us to find out the optimal times to use your T-Shellz Wrap based on your daily routine/schedule. We will be happy to provide you with recommendations based on our experience. Please note that individual results may vary. The information provided on this site is not intended as a substitute for advice from your physician or other health care professional. Warming up tissue before stretching (exercise at home or in a physical therapy clinic) can provide on-going flexibility in your tissue that will continue after the stretch is done. Experiments conducted by medical professionals have shown that applying deep tissue treatments before stretching range-of-motion exercises can provide lingering flexibility that is beneficial when stretching any of the soft tissue in your hip and back. Medical studies have shown a decrease in joint stiffness after the temperature of injured tissue is increased with a diathermic therapy compared to the stiffness experienced at a much lower, normal, body temperature. Tissue and muscles that have been over-strained or injured can suffer from continuous squeezing in the muscle fibres. This is also known as a muscle spasm or trigger point pain. On-going muscle spasms will decrease blood flow and increase your nerves' sensitivity to pain. It has been believed for a long time by many medical professionals that electromagnetic energy can reduce muscle spasms. You could be feeling pain from muscle spasms, lack of blood flow to your soft tissue, tight muscles or tissues, and even stress placed on your body. Pain relief can be felt from introducing Deep Tissue treatments - as increasing the temperature of the tissues will help them feel more relaxed and less constricted. Using an electromagnetic energy treatment, you can produce an increased level of blood flow to the targeted tissues. This results in more nutrients and oxygen reaching those injured tissues, helping to enhance one's recovery. While icing a fresh injury during the first 48 hours is recommended, a better approach beyond that time is to open up the vessels so the body can flush the injured area of the excess fluid and cellular waste resulting from the injury. Excess fluids get trapped and cause vessels to swell - so by expanding the vessels, you give the body the chance to whisk away those fluids and reduce pressure on the vessels. Electromagnetic energy is recognized by many for its role in helping soft tissue injuries by promoting both relief in chronic injuries (torn muscles/tendons/ligaments or arthritis) and speed up the overall healing process for newer (acute) injuries. The unique Sesamoid T-Shellz Wrap is designed with every detail in mind to give you the most effective and most enjoyable therapeutic experience available anywhere. Here’s why! Plugs into a wall outlet using an AC/DC adapter to get the necessary power for consistent therapeutic treatments. Has a special signal controller that can be set for 3 different power levels of application (3 = High, 2 = Medium, 1 = Low) with an automatic 30 minute shut off feature. Has a flexible Energy Pad made from a strong, yet flexible carbon fiber material that conforms easily to your body..
Has a 7 foot long cord so you can sit or lie comfortably and watch TV, read or surf the net while you're using it. Operates with no sound or vibration or motion. Doesn't require the use of creams or gels. Wear the T-Shellz Wrap loosely for easy re-positioning over the treatment area. Has adjustable Velcro straps for a fit that you control to your personal level of comfort. Ability to place the wrap over your clothes for a more comfortable treatment. Uses a soft, breathable material with comfort in mind. Is made of a premium grade neoprene that will retain it's shape over time. What can a Sesamoid T-Shellz Wrap® Treat? Practically any condition or injury affecting the ball of the foot can benefit from treatment with the Sesamoid T-Shellz Wrap. 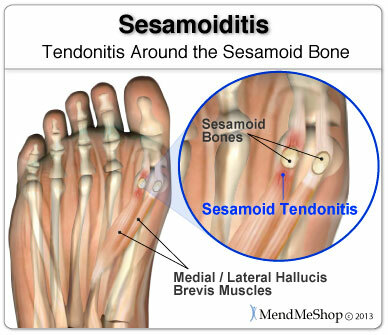 This includes sesamoiditis, plantar plate tears, morton's neuroma, hammer toe, degenerative tissue changes, and general tightness and soreness within the ball of the foot. MendMeShop - Our Reputation Speaks for Itself! Our business is built on our reputation and we want you to be as satisfied with your MendMeShop experience as tens of thousands of our customers are. That is what your purchase from us will be - an experience. Not only do we supply superior products, MendMeShop Specialists are available to help you get the right products and treatment advice. You will also have the peace of mind with our 60 day trial period and our comprehensive 1 year warranty. We know making a decision to find the right pain relief and healing products for you can be difficult, especially on-line, and we don't want you to worry. With every product, you have our guarantee that you will be 100% satisfied or you get your money back. That's how much we believe in the products we sell! Superior products that have been carefully researched and developed to stop your pain naturally and heal you faster. Trained MendMeShop Product Specialists available 5 days a week for individualized help - just call 1-866-237-9608 within Continental North America (+1-705-445-3505 internationally). Our iron-clad 60 day money back guarantee. After following instructions and find your are not satisfied with your purchase, call us to return for a 100% refund (shipping not included). Automatic 1 year replacement warranty against manufacturing defects. In addition to ordering online, you may also place an order over the phone by calling our office directly. We are available Monday through Friday from 9:00 am to 5:00 pm Eastern Standard Time. If we miss your call, please leave a message and we will follow up promptly. Our toll free number is 1-866-237-9608. Living with pain is never easy as it affects your entire lifestyle. Nothing is more important than making the proper decision when it comes to treating your shoulder injury. Most methods only mask the problems or provide temporary relief; they do not treat the pain at its source. 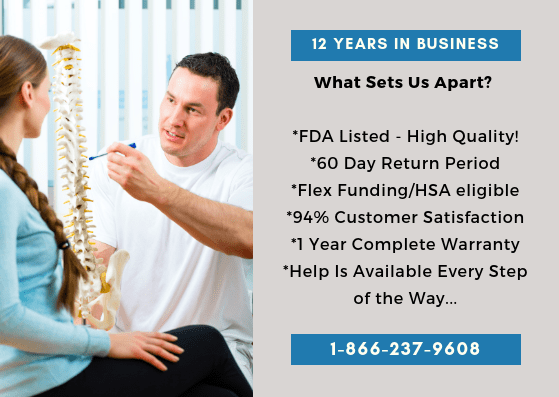 This is where our company stands out as our goal is to help you heal for the long term – without the setbacks you have likely experienced up until this point. The bottom line is, you are welcome to try our products for a full 2 months. If you do not receive the benefits that others have experienced after 6 weeks of fair use, simply return your products back to us and we will issue a prompt & full refund. There will be no hassle and no hard feelings. Please be fair with us and do make a commitment to try the T Shellz Wrap for 6 weeks before contemplating a return. Healing takes time and requires effort to make it happen. You may order online through this web page (at the top - click on Add To Cart) or call us during business hours at 1-866-237-9608. In addition, we do not database credit card information on our internal systems (unlike many companies). Customers seem very appreciative of this fact. In processing thousands of orders over the past 12 years, you can be assured we do whatever it takes to make the ordering process is secure and customer-friendly. I just bought my second Sesamoid wrap! I have life-long foot issues and I was using one wrap around both feet. I decided to treat myself and buy a second one. The comfort provided is like night and day compared to a heating pad. I tried a heating pad the other day and knew it was useless. There is no question that the T-Shellz warmth extends deep into the tissues. It is the BEST source of comfort I have ever had on my feet! And customer service is excellent...Paul is very helpful and is very eager to provide a great buying experience.